June 01, 2015: The pod was first spotted at 4.40 pm on Monday (June 1st) off the coast near the city of Staffin, which is situated on Scotland's Isle of Skye. Mike Merritt took a picture of the pod. Notice that the pod is not swimming in any direction, or diving and feeding. They are sort of drifting along in a relatively calm sea. One whale can be seen raising his head out of the water trying to see what's going on around and near the pod. This is called spyhopping and is strong indication that the pod has no acoustic sense of direction. The loss of their biosonar was most likely due to a previous barotraumatic sinus injury caused by exposure to seismic waves above the epicenter of an earthquake along the Reykjanes Ridge ( see below). Spyhopping behavior is common in pilot whales prior to beaching themselves (link). They are obviously trying to see a way out of the jam they are in. The weather turned nasty a few hours after this picture was taken. The strong shoreward flow of wind-driven currents, coupled with a rising tide, set the surface waters washing ashore. The lost whales swim downstream with this surface flow in the path of least drag. In other words, the surface current guided these lost (acoustically blind) whales into the rocks on Staffin Island a few miles off the northern coast of the Isle of Skye. For more info read how surface currents pick the stranding site, not the whales (link). Three whales died early Tuesday morning before the rescue team got there (link). The rescuers waited on the tide to crest, and then when the tide had reached its high, and started to flow back out towards deeper water, the rescuers pushed 18 non-navigating pilot whales back in the water, praying the out-flowing tidal currents would guide them far away so they could claim success and beg for more donations. However, the strong shoreward wind overpowered the tidal outflow and guided 13 of the non-navigating whales back into the rocks for the second time. Six have since died - including a pregnant whale - and attempts are underway to push the remaining seven into a current that will wash them out of sight where hopefully the sharks and killer whales will clean up the mess (link). On the contrary, the surface currents brought six of the seven whales back close to the island again (link). British Divers Marine Life Rescue (BDMLR) said it was monitoring the six long-finned pilot whales. It said the animals did not appear to be at any risk at the moment, but the tide will be falling at the undisclosed location later on Thursday (link). The rescuers told the truth in the video below. They said they were able to free a few animals, but had no idea where they went. Now they are back again. If these whales were healthy and navigating, they would have swam so far away that they would never come back. But they were LOST when they went ashore the first time, and still LOST when they came back. 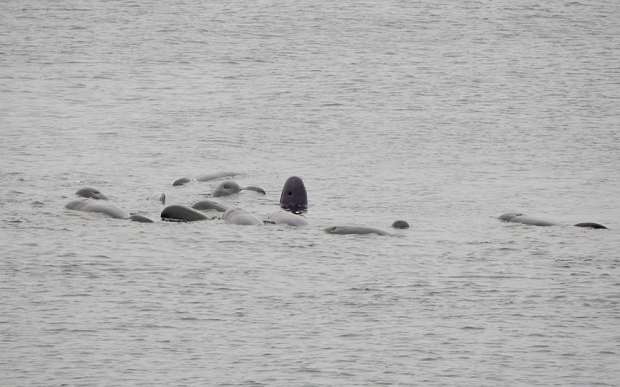 The rescuers also advance the mistaken idea that the pod followed the pregnant mother into shallow water and got accidentally washed into the rocks. They said the pod wanted to be with the mother because she was going through the difficult birth. This is a stupid opinion not supported by any logic. Those in the rescue business must offer an explanation which misleads the public to believe that previously healthy whales stranded by some stupid mistake, rather than an injury. They cannot tell the public the truth because, in order for the whales to be worthy of the time and effort to save them, they must be healthy and have a functioning biosonar system. They cannot be acoustically blind. Otherwise, the rescuers should put them out of their misery. If they told the public their biosonar system was disabled by an undersea earthquake, then donations will drop to zero and their entire efforts will be for naught. Campaigns to raise money such as this one (link) would fail. The beach ball on the right tells us that this was a normal faulting earthquake; a type that initially generates a very powerful negative pressure pulse. The depth of the hypocenter is shown at 10 km; however, this is simply a minimum default value. As you will read below, this quake was more likely only 3-5 km below the rock-water interface. This is important because the closer the focal point is to the diving whales, the greater is the danger. This quake was only 4.9 magnitude but still managed to cause an injury in the cranial air spaces of at least 21 members of this pod. This particular event has a special meaning to me. Please allow me to explain. The intensity of the seismic pressure changes in the water above an undersea quake depends on how deep the focal point is in the seabed. If the focus (hypocenter) is deeper than the length of the seismic p-waves, a lot of energy will bounce off the rock-water interface and return back to the solid bottom. These bouncing p-waves will still disturb the rocky seafloor, which will in turn disturb the water column, pushing and pulling and generating secondary hydroacoustic pressure pulses. Energy is lost in this process. This means that the whales must dive to within less than 500 meters of the rock-water interface or the quake needs to be a greater magnitude than 4.9 Mw. There is another interesting unknown factor that up until this incident has puzzled me. If the distance from the focal point to the rock-water interface is less that the length of the ~7 km long p-waves, the seismic waves will travel through the rock-water interface as if there were no interface at all. This is called an anomalous transparency (link) by the NOAA physicist Dr. Oleg Godin who discovered it. This means that if the hypocenter of the quake is less than 7 km from the rock-water interface, then the disturbance in the water is much greater. However, the depth of focus of earthquakes along mid-ocean ridges have been defaulted to 10 km for the last 30+ years. Prior to around 1980, the hypocenters were defaulted to 33 km. This meant that there was no way to identify the very shallow whale dangerous earthquakes. I was finding a few 4.7 magnitude quakes associated with beachings, but could not verify their actual depth of focus. I also notice that mid-ocean ridge earthquakes associated with mass stranded whales were occurring in only about 10 locations around the world. Each location was about 150 miles long. But I could not imagine a condition that might cause these segments to be the most dangerous to whales until yesterday. One of the 10 locations is the Reykjanes Ridge that runs up through the center of Iceland. Earthquakes on this ridge cause a lot of mass strandings. During the research for Isle of Skye stranding, I noticed that the closest seismic station to the Reykjanes Ridge quake was a station located in Iceland. I went to their website looking for information and discovered for the first time that they were listing focal depths as shallow as 0.1 km (link). This station reported that a 1.4 magnitude quake occurred only 0.1 km below the rocky seabed. If a 1.5 mag. event can occur at a depth of 0.1 km, then it seems reasonable to suspect that a 4.9 mag. event might occur less than 5 km deep. If this is true, and I believe it is, this might explain why there are only 10 segments along the entire 40,000-mile-long mid-ocean ridge system that cause pod strandings. The Reykjanes Ridges sets atop of on extensive volcanic hot spot. The 9 other whale-dangerous zones are also situated above volcanic hot spots that may indeed be home to many extremely shallow earthquakes in which the seismic energy passes through an anomalous transparency directly into the water without energy loss or deflection. It is even possible that extremely shallow earthquakes do give off low-frequency microquake rumblings that the diving whales hear to warn them of a pending whale-dangerous earthquake. Odontoceti can no doubt detect earthquake precursors, sometimes days in advance. 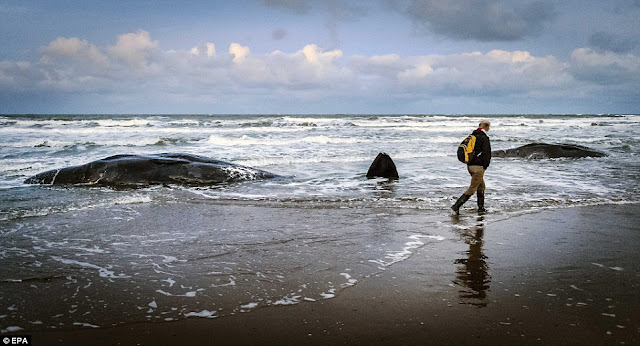 If so, mass strandings due to seaquakes would only be possible when for some unknown reason this detection system failed, or a hungry pod ignores the warnings. Furthermore, precursors signals also likely radiated into the water but the earthquake never occurs. These false signals might lure toothed whales into remaining near the epicenter for too long, especially if there is plenty of food available. At any rate, the pod beached on the Isle of Skye suffered a barosinusitis injury that knocked out their biosonar system. They surface and soon drew the attention of a hungry pack of oceanic sharks. They then gathered in tight formation and became swimming to escape the sharks. But since they had no sense of direction, the flow of the surface currents took over as their only form of navigation. They simply swam downstream in the path of least drag with a pack of hungry sharks trailing them, picking off any stragglers. The surface currents then stirred them to the Isle of Skye where they were washed into the rocks by extra strong storm currents.